The current state of environmental custodianship in Qatar leaves much to be desired from the national government and other institutions that publicly endorse initiatives with much fan-fare but do not commit to sustained action. My previous piece titled “Environmental Initiatives in Middle East – Challenges and Remedies” illuminated some of these gaps, but did not provide a detailed description of what underpins this trend and possible solutions might look like. Thus, this article seeks to delve deeper into how state institutions and civil society in Qatar may be able to work cooperatively in staving off further environmental degradation, especially with regards to waste management and recycling. I believe that real success will be achieved through popular buy-in and a paradigm shift towards recognizing the interconnectedness of humans with their surroundings, which can be encouraged through education. Perhaps more importantly, there needs to be a public acknowledgement that all individuals residing in Qatar have a vested interest in pushing for greater environmental protection enforcement and accountability. In a region that is already faced with a lack of potable water and arable land, allowing the existing course to be maintained is not only risky, it is flat-out dangerous to the nation’s survival. Individuals that either live in or visited a Gulf Cooperation Council (GCC) nation, especially a hydrocarbon-rich rentier state like Qatar, are probably quite familiar with the inadequacies of current recycling initiatives. As someone who has visited the country on three different occasions I can tell you that I have searched high and low for something resembling a recycling bin, can, or other receptacle but to no avail, save for a few located in Education City. One might imagine this to be exceptionally jarring coming from the hyper-attentive, green-obsessed Washington, DC where trash and recycling cans typically are placed together on streets and in buildings. Further adding to my chagrin is the apparent disconnect between high level, widely publicized recycling improvements and the realities (and consequences) manifesting among general society. For example, last year there was much excitement surrounding the announcement of upcoming environmental reforms in July 2014, but it appears nothing further came to fruition. The article touches upon some of the apparent hindrances for recycling programs and other environmental initiatives: bureaucracy; paperwork; budgetary constraints. I would add to this list based upon personal experiences: general apathy towards recycling; inaccessibility of bins; perception of additional costs to conducting business. Fair enough – I acknowledge that some of these issues are out of citizens’ and expats’ hands, but that is no excuse for giving up. The predicted 6.8% GDP growth spurred by the upcoming 2022 FIFA World Cup and hydrocarbon exports will surely put further pressure on an already fragile ecosystem and lead to an uptick in waste production. This is not meant to stoke unnecessary fear, but the equation here is straightforward; more people present in Qatar, more trash will be created from residential and commercial zones. As noted by fellow EcoMENA contributor, Surya Suresh, the nation presently possesses one solid waste facility at Mesaieed and three landfills devoted to particular items, which now seem to be overwhelmed by growing waste inputs. 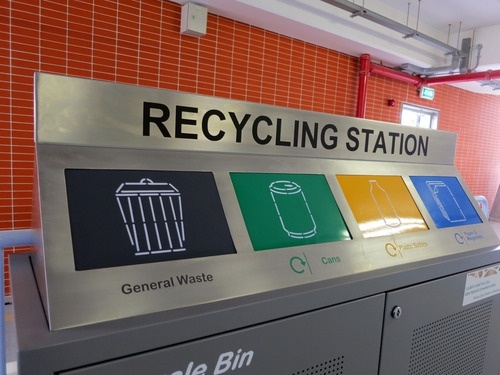 Given this lag in state responses to the existing recycling crisis and future issues stemming from it, readers may be asking what they can do to help. At the personal level, I would encourage Qatari residents, as well as others in neighboring nations, to begin with educating themselves about the current state of recycling initiatives and conducting an inventory of their daily waste generation. EcoMENA website offers a variety of informative pieces and external resources useful to individuals seeking more information. My latter point about doing a personal inventory is about consciousness-raising about how we each contribute to a wider problem and identifying means of reducing our impact on the environment. Examples from my own life that I believe are applicable in Qatar include counting the number of plastic bags I used to transport groceries and replacing them with a backpack and reusable bags. I also frequently re-appropriate glass jars for storing items, such as rice, spices, and coffee – make sure to wash them well before reuse! It has taken me several years to get to past the social stigmas surrounding reusing containers and to cultivate the future planning to bring my reusable bags with me, but knowing my actions, aggregated with those of my friends and family, positively affect the environment is quite rewarding and reinforces good behavior. Give it a shot and see what happens. Furthermore, it may be beneficial for the community at large to begin discussing the topic of recycling and what they would like to see, rather than solely wait on state agencies to address issues. Doing so could initially be formulated on a level that many Qatari residents are probably most familiar with: their place of employment, apartment, or neighborhood. After all, if individuals, specifically employers, are expected to bear the increased costs associated with improved recycling then an understanding of what people want is necessary in hopefully resolving issues effectively and with greater community enthusiasm. Because of the nature of nation-states’ institutions typically being reactive entities and incapable of being aware of every societal problem, it is up to community-level groups to voice their concerns and be committed to change. Organizations such as the Qatar Green Building Council and the Qatar Green Leaders, offer a variety of informative pieces and training services that may help in establishing dialogues between groups and the government. Perhaps this is too idealistic right now, but Qatari residents have organized popular support for other initiatives, notably in the initial pilot recycling program in 2012. Now let us make that a sustained commitment to recycling! Andrew Clark, “Environmental Initiatives in Middle East – Challenges and Remedies,” on EcoMENA.org, http://www.ecomena.org/environment-middle-east/. Doha News Staff, “Official: New, Sorely Needed Recycling Policies in Qatar Afoot,” on Dohanews.co, http://dohanews.co/official-new-sorely-needed-recycling-policies-in/. Doha News Staff, “Responding to Community Calls, Qatar Rolls Out Pilot Recycling Program,” http://dohanews.co/responding-to-community-calls-qatar-rolls-out-pilot/. Tagged Bins, Community, Doha, Ecomena, environment, Expats, FIFA World Cup, garbage, GCC, Plastic Bags, Qatar, Recycling, Recycling in Qatar, Trash, Waste Management, Wastes. Bookmark the permalink. From what i read and see around, the momentum is growing toward recycling, it’s more a social pressure from the public on the government to take some actions now. Dear Andrew, I am currently in Doha. I am an environmental engineer and I come from Italy. I have professional experience in waste management and environmental monitoring. In my municipality in Italy the segregation of domestic waste is up to 80% because waste is collected door to door, and there are many municipalities that joined the “zero waste programme” that also Los Angeles joins. But it is not enough. The real aim is to diminish the quantity of waste produced. The first effort could be to replace plastic bottles of water with refillable bottles, or, also, water suppliers at home, those with a refillable tank, like the ones you see in offices and public places. My opinion is that we should start, in Qatar, to raise awareness starting from schools. Children could brig goos habits into their families. But there must be an effort from the public sector. If you do a lot of efforts in segregating waste at home but you can’t see a real commitment from the local authorities, you feel discouraged and you don’t do it anymore.